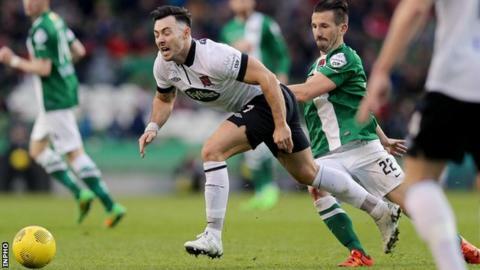 Dundalk clinched their first League of Ireland double since 1988 as Richie Towell's extra-time goal secured a deserved 1-0 victory over Cork City in the FAI Cup Final at the Aviva Stadium. Towell hit the winner two minutes into the second period of extra-time as he finished to the net from close range. Dundalk had the better of the action in normal time with Ronan Finn, Dane Massey and Towell all going close. Daryl Horgan set up the winner by going on a run before squaring to Towell. The winning strike was Towell's 29th goal of the season. Dundalk's victory emphasised their status as the top League of Ireland team after they comfortably retained the Premier Division title last month. Cork were also runners-up in the league although the Leesiders were 11 points behind Stephen Kenny's side.